Want to watch your favorite Dear Evan Hansen musical show live? Tickets4Musical is here to provide you cheap Dear Evan Hansen tickets. 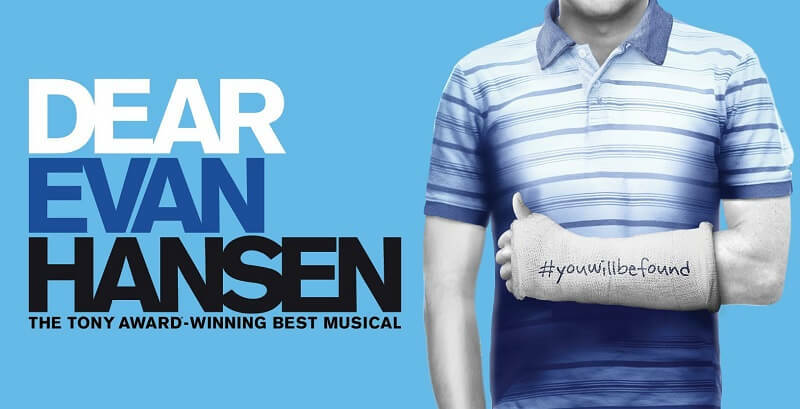 We have huge selection of Dear Evan Hansen tickets and you can select your seats according to your budget. Tickets4Musical is the best site to get discount Dear Evan Hansen tickets and all related info like Schedule, Seating Map, Tour Dates, etc. We have secure payment system and provides you 100% buyers guarantee. We also offer Dear Evan Hansen Discount coupon. You can use promo code FIESTA and get 3% discount on your purchase. Hurry Up and Reserve Your Dear Evan Hansen Tickets Cheap Now Before it Get Sold. Dear Evan Hansen musical, co-created by Benj Pasek and Justin Paul, explores the loss, lies and loneliness experienced by a teenager in high school. After its Broadway debut in December 2016, Dear Evan Hansen has received huge success for many have embraced the shows depiction of mental health issues, commonly faced by teenagers. Combined with amazing music, lyrics, and actors, Dear Evan Hansen is simply a must-see.